UKRAA is proud to announce the E-Field probe active antenna amplifier and Bias-T as designed by Dave Powis G4HUP and originally sold under the HupRF brand. This kit won the Construction category at the Radio Society of Great Britain Construction Competition 2016. The user needs to connect a short whip or plate to the amplifier and enclose the assembly in a weather proof enclosure ready for installation. The completed antenna is a compact alternative to traditional HF antenna designs. The amplifier has a good response from below 20kHz to over 30MHz and is ideal for monitoring both wanted signals and HF band interference. For the radio astronomer it covers the VLF band and would provide a means of monitoring interference. 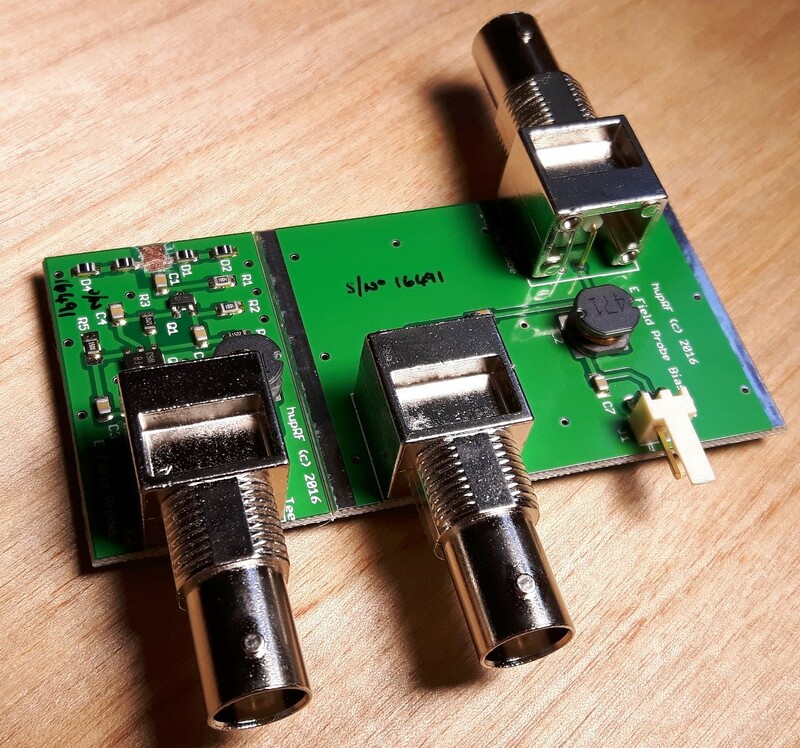 The amplifier and Bias-T is available either pre-built or in kit form and is simple to build and install and provides a good quality active HF antenna suitable for use with SDR receivers. It is also an ideal project to learn and improve your ability to solder Surface Mount Device (SMD) components. This kit is suitable for Clubs to use as a training aid for soldering skills and gives course participants a useful new piece of kit after the course. The pre-built amplifier and Bias-T can be purchased here from our online store. While the kit form can be purchased here from our online store. Fabulous bit of kit – most value for money Amateur Radio item for many years. I have logged over 300 LF NDBs, 56 DGPS beacons and quite a lot of HF traffic up to 18MHz. One evening I had 3 decodes from VK6XT at 14,872km distance on 3.5MHz WSPR and decodes from K3RWR and AA3GZ on 1.8MHz. Also I have used the kit as a means of teaching hand soldering of surface mounted components. I certainly recommend the product.